Born on the battlefields of feudal Japan, Traditional Jiu-Jitsu fulfills the same role today that it has for over a thousand years - providing the means to defeat an aggressive opponent who means to put your well-being at risk. 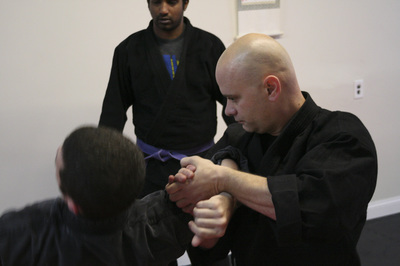 Kanjizai's Traditional Jiu-Jitsu system combines the most effective techniques for modern self-defense into a cohesive, structured curriculum that can offer effective street readiness in as little as 90 days. In feudal Japan, Jiu-Jitsu was practiced by the Samurai, a warrior class whose sole occupation was the cultivation and execution of combative skill. It was developed in a time when life-and-death struggle was a daily reality. This constant need to fight for survival birthed one of the most sophisticated warrior cultures the world has ever seen. The pragmatic and efficient martial arts they developed are more widely practiced than ever before. Traditional Jiu-Jitsu (spelled"Jujutsu" in Japanese) includes joint manipulation (Kansetsu Waza), ground fighting (Ne Waza), throws (Nage Waza), chokes (Shime Waza), and striking techniques (Daken Gata), among other areas of focus. Kanjizai's traditional curriculum contains 10 levels leading to black belt. Our instructors guide students through each level with patience, insightfulness, and 20 years experience in Traditional Jiu-Jitsu. At black belt, students can study the traditional Japanese schools of Jiu-Jitsu (Ryu-Ha) that comprise the fundamental curriculum, and eventually test for mastership certification in each one. These schools include Takagi Yoshin Ryu, Shinden Tatara Ryu, Asayama Ichiden Ryu, and others. As a student progresses, they will be able to test for mastership certification in each one these traditional schools. Kanjizai guides students through its ​Jiu-Jitsu Self-Defense curriculum with a structured rotating class schedule that makes learning and retaining information easier.